FREE GOLF IS AVAILABLE FROM MAY 15 - OCTOBER 15. RECEIVE 8 FREE ROUNDS WITH 7+ NIGHTS RESERVATION, CART FEE APPLICABLE TO GUEST. Golf is provided @ Green Links, Naples. At The Knickerbocker Estate, even the most well traveled among you will OOH and AAH over all THE LITTLE LUXURIES that await you. BRING ALL YOUR FRIENDS TOGETHER under one roof! This oversized, relaxing, family friendly PRIVATE COUNTRY ESTATE has EVERYTHING YOU NEED. LARGE POOL, AND ONLY A 20 MINUTE DRIVE to THE BEACH and WORLD CLASS GOLFING. 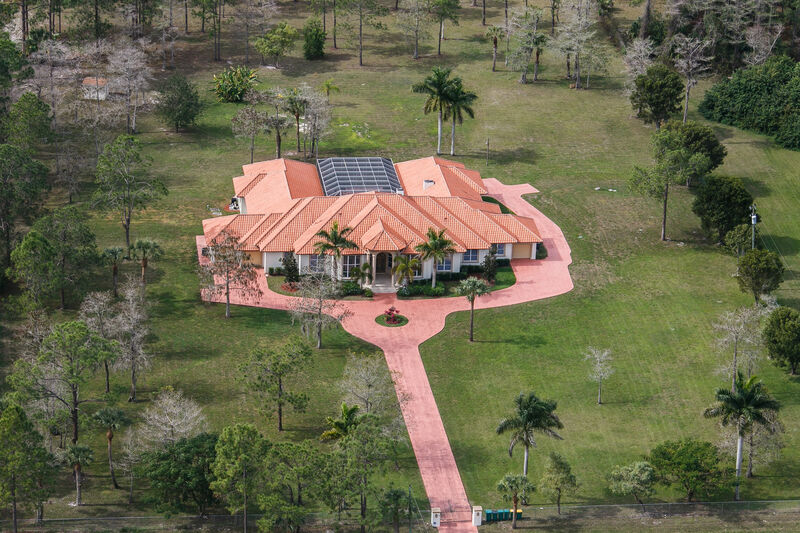 This unique estate sits on the east end of Naples. Secluded, newly updated, private pool and spa, 8 bedrooms (sleeps 20), 4 1/2 baths, 4 plasma TVs, private backyard and pool (use of heater is optional), large gathering rooms (customizable to your needs), patio furniture, pet friendly with manager approval, ample parking (garages are not accessible), plus a fully stocked kitchen for dining in the comfort of your Private Country Estate. 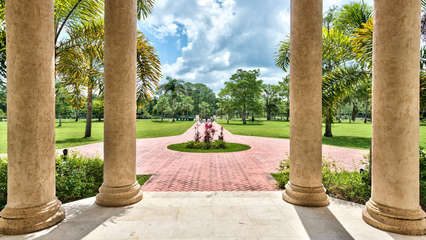 This private estate home is nearby Vanderbilt Beach, Delnor-Wiggins State Park, The Mercato, Waterside Shops, Venetian Village, Fifth Avenue, Interstate 75, The Naples Zoo, Naples Botanical Gardens, historic Naples downtown 5th Avenue South, luxury shopping, fine dining, grocery stores including Whole Foods, as well as the Naples Pier and much more. This western exposure PRIVATE ESTATE HOME is also perfect for retreats, corporate events, weddings, private receptions, anniversaries, and gatherings in Naples (special fees apply). Nearby Ritz Carlton and LaPlaya Beach Resorts. Perfect also for up to 10 couples to share this estate home. Book early as it gets filled quickly!!!! PLEASE NOTE THAT THIS PROPERTY IS ONLY REPRESENTED BY NAPLES FLORIDA VACATION HOMES LLC. ANY OTHER PERSON, INCLUDING A CRAIGSLIST LISTING, IS NOT AUTHORIZED AND PROBABLY A SCAM. Scammers usually don't like to talk on the phone so call first to verify. Payments by MasterCard, Visa, American Express, ACH or electronic check welcomed when booking direct with local vacation rental management company. Never send money via wire transfer - especially overseas. Pool Heat is an additional cost per night. The pool/hot tub WILL NOT be hot without the heater turned on. The cost of pool heat is $60/ day. If you decide to purchase the pool heat when you are already in the property, the cost is $100/day.The pool pump is run from 8am to 10pm. If the temperature outside is under 65 degrees, the pool heater will take up to 5x longer to heat. Sorry, no refunds for cold weather. A set of sheets, pillows, and a blanket is provided for each and every bed in your vacation rental. When you arrive, the bed will be nicely made up with commercially laundered linens. We do not provide extra blankets or sheets. One bath towel, one beach/pool towel, one wash cloth is provided for each guest in accordance with the maximum occupancy of your vacation rental unit. One bath mat and one hand towel are provided per bathroom. 4 kitchen towels, 4 kitchen wash cloths and two oven mitts are provided with each rental. Additional linens or a change of linens are available by request and at additional charge. Hand soap at each sink, 1-2 rolls of toilet paper per bathroom, one roll of paper towels, several laundry pods & dishwashing detergent pods, dryer sheets, 6 garbage bags and a new sponge for washing dishes. These items are designed to get your stay started, but not intended to last the duration of your stay. Guests staying longer than a couple of days, even for 30+ days are expected to purchase and replenish their own toilet paper, etc. *Shampoo, conditioner, hand lotion, facial tissues and other toiletries are not included. Also, while there is generally a broom, dustpan and vacuum available at each vacation rental, we do not provide cleaning supplies and tools at our vacation rentals. Maid service can be arranged for additional charge. Our kitchens are equipped with a variety of items generally used for simple everyday light meal preparation. Small appliances will always include a coffee maker and toaster. Some of our owners provide additional small appliances like an electric kettle for boiling water and a blender. If there is something you would like to have for your own enjoyment, please purchase it yourself. If you don’t want to take it home with you, leave a note on it and our team will gladly donate it to a resale shop which supports local charity. Sorry, we do not provide the service of purchasing and delivering additional kitchen items unless specific arrangements are made in advance of your stay and at an additional cost. If there is something specific you need, we encourage you to bring it with you or to purchase it locally for your own use. In the case of single family homes with BBQ grills, there is generally a half tank of gas available. If you run out, please take the local Walmart, gasoline station or hardware store and purchase a replacement tank. If you need a member of our staff to do this for you, there will be a $75 service charge. If you are staying in a condominium, generally the Association will provide gas for the community BBQ. **This property runs on a well system and at times the water can have a smell that is unpleasant to some. The water is safe to use.